The techniques involved in creating a metal critical assembly were being demonstrated to several people. 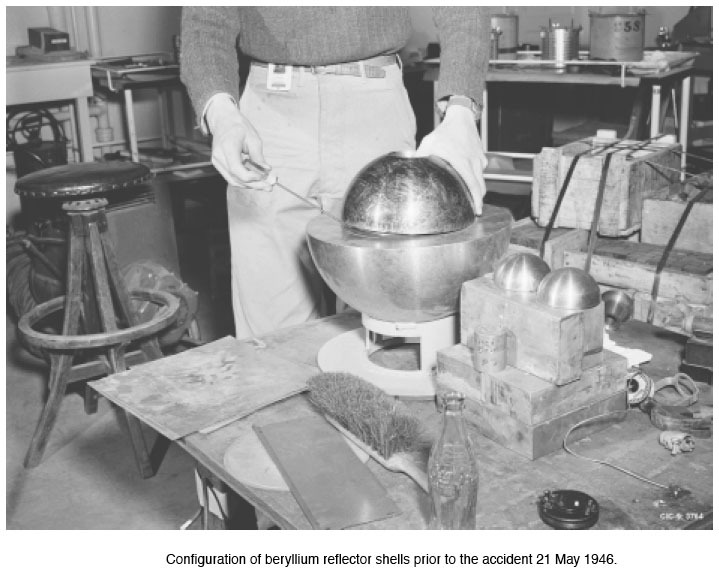 The system consisted of the same plutonium sphere reflected, in this case, by beryllium. The top and final hemispherical beryllium shell was being slowly lowered into place; one edge was touching the lower beryllium hemisphere while the edge 180° away was resting on the tip of a screwdriver (Figure). The person conducting the demonstration was holding the top shell with his left thumb placed in an opening at the polar point. The yield of this excursion was 3X10*15 fissions; again, there was no rupture of the nickel canning. The eight people in the room received doses of about 2100, 360, 250, 160, 110, 65, 47, and 37 rem. The man who performed the experiment died nine days later.